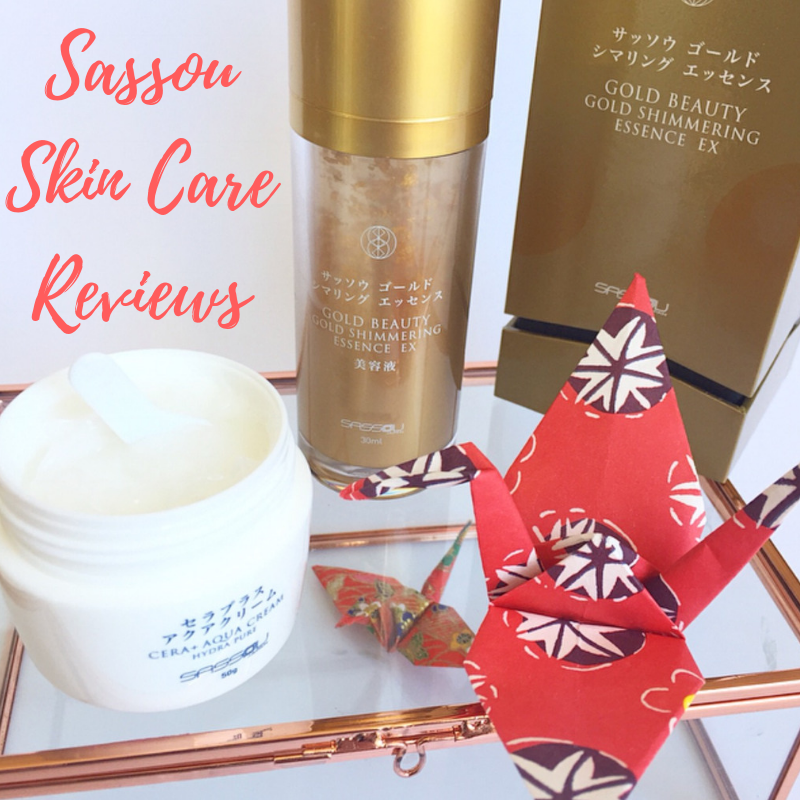 I was excited to recently be gifted a couple of luxurious Sassou Japan skin care products enabling me to share my Sassou Skin Care reviews here with you. 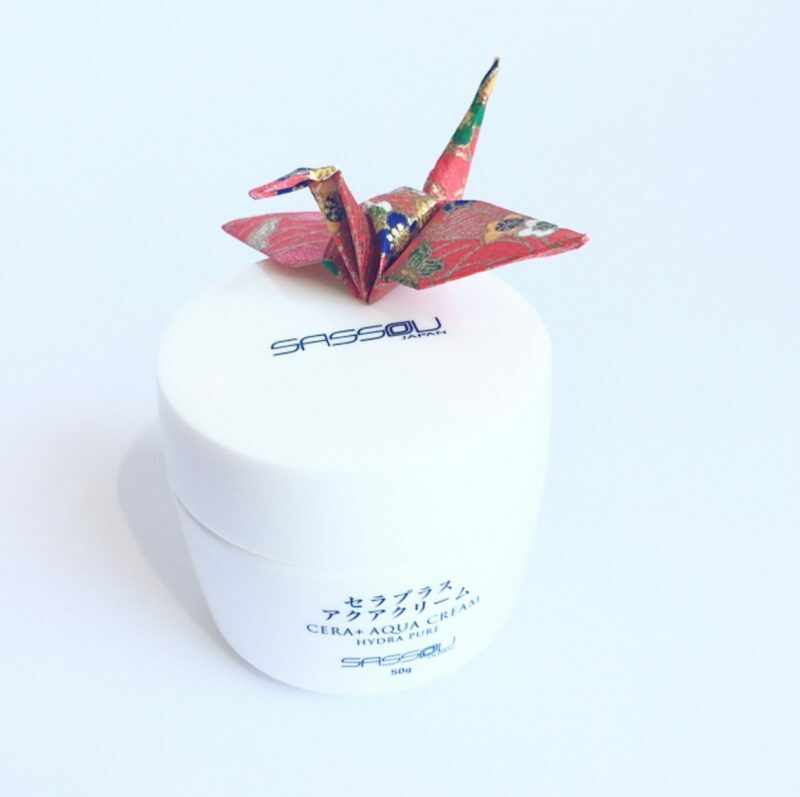 Sassou means ‘free and breezy from heaviness’ in Japanese and Sassou products are formulated to result in a light and relaxed feel after every use whilst providing you with noticeable skin benefits. Sassou Hydra Pure Cera+ Aqua Cream from the Hydra Pure Series. The Gold Shimmering Essence EX comes from the Sassou Gold Beauty Series. 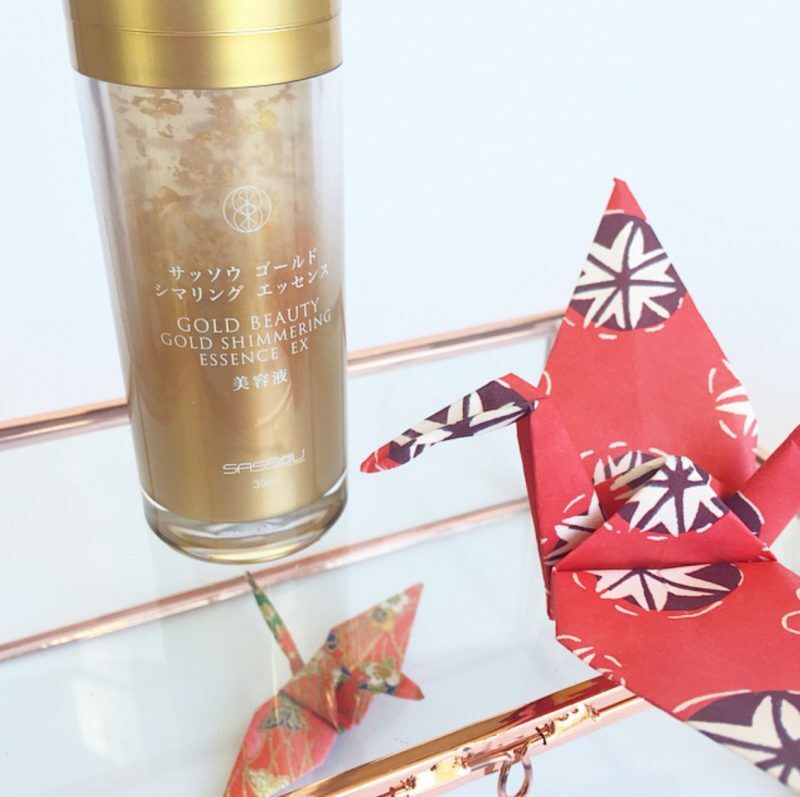 The four main ingredients in this series include pure gold from Japan, platinum, honey and plant extracts. The Gold Shimmering Essence EX contains plant based collagens and hyaluronic acids which stimulate collagen generation. This restores skin elasticity and fights against free radical assault. It also enhances detoxification which in turn improves overall skin quality and luminosity. With pure gold leaf infused throughtout this essence it looks absolutely amazing! 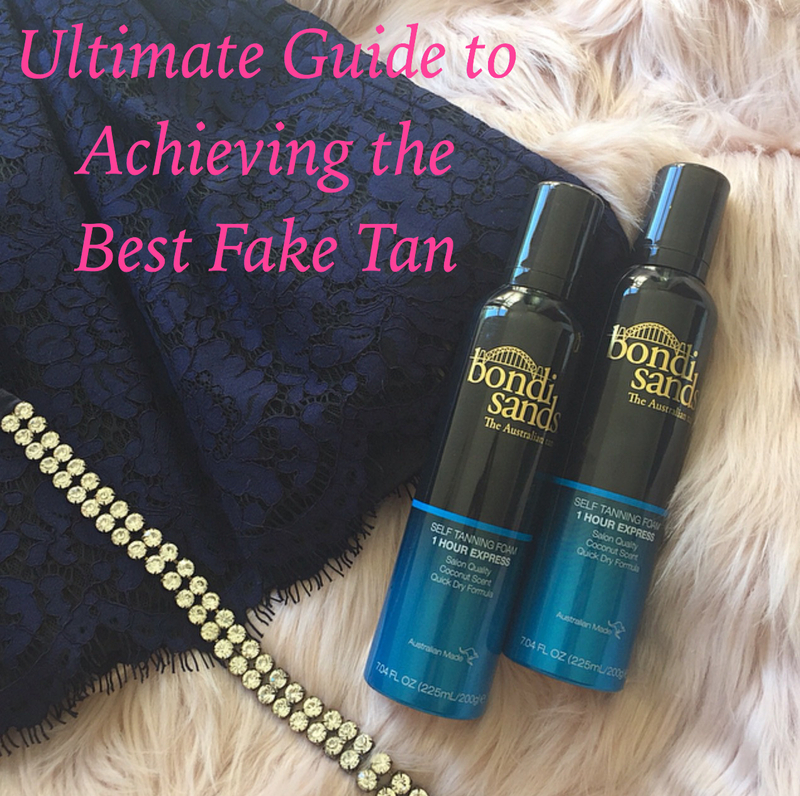 I feel like I should be storing this product in a vault rather than putting it on my face but the following beauty benefits of gold skin care convinced me to use it as intended on my face. The use of gold in skin care dates back to ancient times. Ancient Egyptians, Romans, Chinese and Japanese have all considered gold to have medicinal properties and used it to treat various skin conditions. The pure gold in Sassou products is sourced from Kyoto and Kanazawa, the Gold Leaf Capital of Japan. The fertile land and pure water there produce the finest Japanese pure gold (food grade gold leaf). This product is very easy to use. After cleansing your face you simply apply a moderate amount of product onto your face and neck, and pat it gently until it fully absorbs. 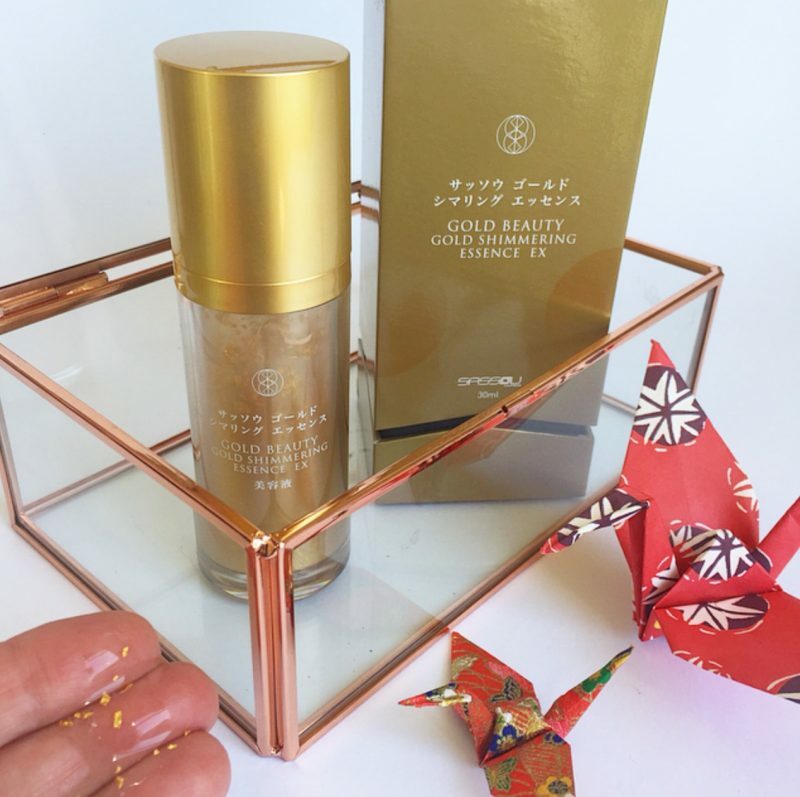 I found the Sassou Gold Shimmering Essence EX to absorb into my skin very quickly. I had been a bit concerned prior to my fist use of this product that I’d end up with flakes of gold leaf stuck on my face but this was not the case at all. It all absorbed rapidly into my skin with just a few pats. Straight away my skin looked more radiant and luminous, and thus more youthful. 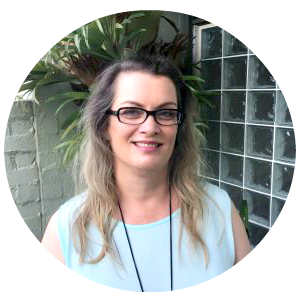 My pores also appeared minimised and my skin felt hydrated and firmer. Even based on my relatively short term use of this product I highly recommend it. I’m looking forward to seeing what the longer term benefits of continuing to use this gold skin care will be. The second Sassou skin care product I received was the Sassou Hydra Pure Cera+ Aqua Cream. This is a moisturising gel cream packed with super hyaluronic acid and ceramides. With 3 different molecular sizes of hyaluronic acids, 3 types of ceramides and Japanese deep ocean water, this lightweight gel cream helps to retain moisture at different skin layers 24 hours a day. 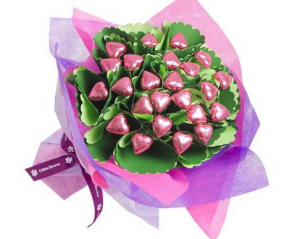 The moisturising ingredients are encapsulated and are released fresh by gentle massage. It’s easy to apply after facial cleansing and you only need to massage the cream on your face for 5 seconds to release the aqua droplets. I love that the packaging of this product includes a mini spatula to apply the cream with, as shown in the photo below. This ensures the product stays hygienic and reduces the risk of contaminating the product. I found this gel cream to be non-tacky and I felt the hydration benefits on my skin immediately. I love the smooth texture of gel creams like this one. A little of this product goes a long way. 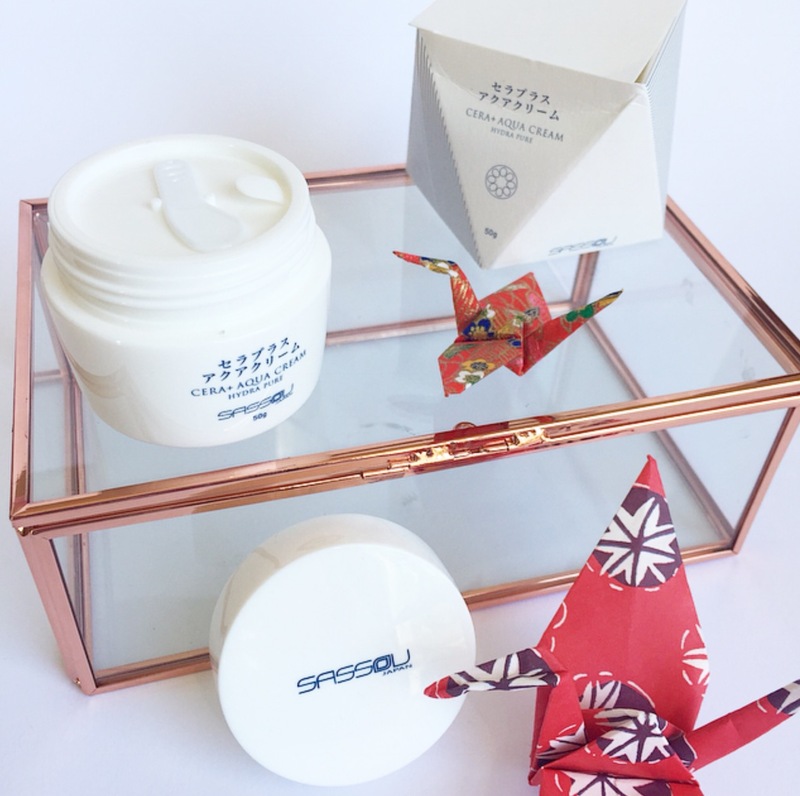 Overall I love these two luxe Sassou Japan skin care products I’ve trialed and I’ll happily be continuing to use these products in my daily skin care routine. To find out more about the Sassou skin care ranges and how to purchase these products you can visit the Sassou website HERE. You may also be interested in reading the Fabulous and Fun Life Guide to Finding The Best Hair Straightening Brush. Click here to read. Have you used any Japanese skin care products? That shimmering essence looks beautiful, so glad they worked for you! Anything with gold flakes in it makes me swoon. It looks super so luxe! I am yet to use the Sassou skincare products I have, but am even more excited to use them after reading this. The gold flakes look so luxe! I can’t wait to try the Gold Shimmering Essence! I haven’t tried an essence before, but this looks so easy and the gold is so enticing I can’t not use it.